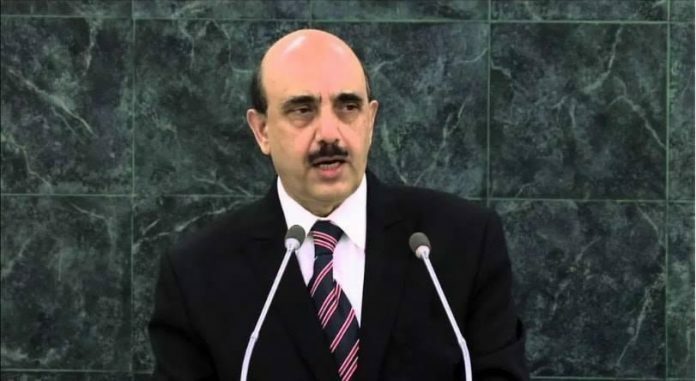 Pakistan administered Kashmir President Sardar Masood Khan Wednesday said that people of Pakistan believed that there was no military solution to the Kashmir issue and it could only be resolved through diplomacy and politics. He said this in response to a question during an event held at the Oxford Bookshop in Clifton Karachi, Dawn reported. Khan said people needed to know that since 1947, Indian forces had killed 500,000 Kashmiris; and since last Friday alone they had taken 24 lives. Replying to a query about militancy that got involved in the Kashmir struggle post-Afghan war affecting the fight for freedom in Kashmir, Khan said Pakistan fought three wars with India over Kashmir –– in 1948, 1965 and 1999 (Kargil). He said after 9/11, many countries dubbed their enemies ‘terrorists’. India also used the same terrorist tag for Kashmiri freedom fighters. Pointing out this thin line, Khan said this was the reason that to date a particular convention against terrorism was yet to be passed by the United Nations because there was a difference of opinion on it. “India told a false story to the world. The fact was that today Kashmiris were the most unarmed people in the world. India was afraid of the people who gathered in Srinagar and chanted Hum kia chahtey hain, azadi. According to a senior Indian security official, the number of militants that existed in Kashmir was not more than 250. So, 250 were fighting against an army of 700,000,” Khan said. Khan said there were three things common between Palestine and Kashmir: one, both were Muslim regions; two, both were fighting for the right of self-determination; three, the countries that had occupied them –– India and Israel –– had close ties with the US. The difference was that the issue of Palestine had got a lot of publicity in the world. Then the EU was in Palestine’s favour. Whereas Kashmir was called [by them] a “frozen dispute”. [The truth was] blood was being spilled on a daily basis in Kashmir.